Dolls, Today's post going to be one of the fun yet informative post . I've officially started Guest Blogging section so any of you if interested in doing a guest blog post feel free to drop one line @ sana.s.ansari@hotmail.co.uk along with the post , your introduction and pictures . 1-What is your name, age and day job? 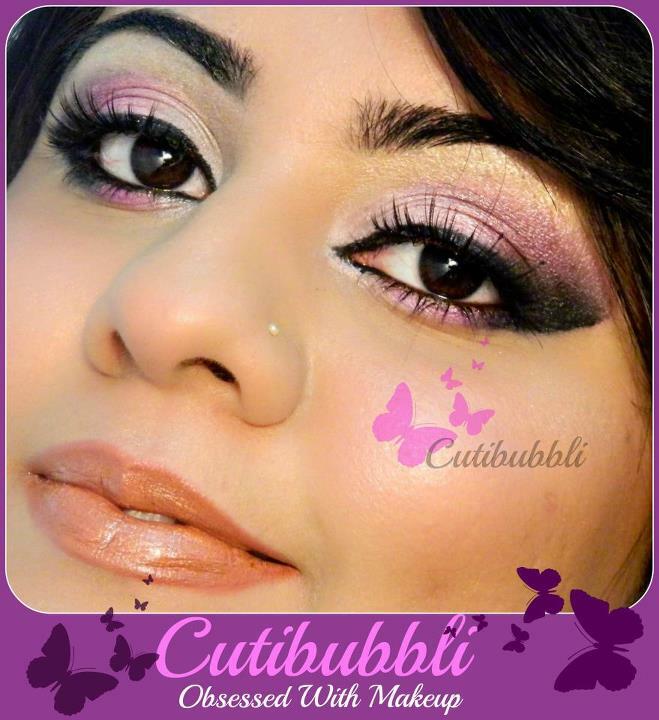 A- People in makeup world knows me as Cutibubbli, but my real name is Farah Yasin Choudhary. Recently I have completed my Masters in Special Education. I want to take my makeup passion as my career and InshAllah I'll fulfill my goal if you all pretty dolls out there kept on supporting me. 2- Where do you get inspiration for your makeup styles? A- When you are in to something, think criticaly over it you automaially starts to get ideas. I love colours, I like to play with them, from the start I am in to Art & Craft thingy, so when it comes about colour, techniques and all I have wide perception. 3- What would you say is your 'signature' look? A- I would consider my personal signature look as quite dramaticly lined eyes, with many different combinations of colour blended together. I personaly love to impose emphasis on my eyes. 4- What age range do you think your style and make up looks are intended for? A- Well I think its about how you carry a particular style, by slightly changing it according your age. Its totally up to an individual, I never wanted to target a particular gentry, I want to make looks for every age groups. 5- How did you learn how to apply make-up? 6- Out of all of your looks what would you say is your personal favorite? Because it has all pretty soft colours which perfectly defines the innocense of a girl. 7- How do you handle criticism and what advice would you give to sisters who receive criticism for their style? A- Well criticism helps you in moving forward without making errors again. Positive and constructive criticism is always welcomed from the core of my heart and I always appreciate people who give constructive advices. 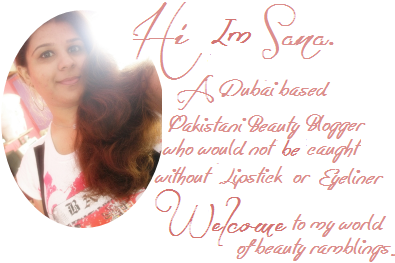 But baseless comments and criticism is not at all welcomed :D And I want to advice other beauty bloggers out there especially pakistani beauty bloggers that never get under estimated if someone just pass lame comments never let yourself down, you are great in your own way, its easy to read see and pass comments but always hard to face the judgment. 8- What is your favorite makeup store and favorite make-up brand? and why? In Bahrain: City center, Bahrain mall or seef mall. Malaysia (KL): Time square mall , Sogo mall. Mikyajy: The brand which admires alot with its great products. Each and every stuff is worth buying there. (Thier liquid eyeliners are highly recomended, Nail enamels with diamond shine). As its an middle eastern brand so the pigments of the products are so good. Also you can check our thier sub brands in thier counter which are more affordable and good in quality. 9- How do you afford to buy so much makeup products? 10- A lot of sisters go and spend a lot of money on make-up, what sisterly advice would you give to them? A- Well I would advice them to spend wisely on products, Buy stuff which is practicle to use, If you are a beginner, I would suggest you to start off from buying reasonable brands, Always search about the reviews in internet about the specific product before purchasing and be aware of fake products, belive in quality not in quantity! 11- How does it feel to be a makeup artist ? A- Well an artist is always a sensitive, We starts to take things very critically, and tries our level best to reach to its depth. Same thing is implimented on makeup, we strive for perfection as much as we can, its not only about putting makeup on face, Its also about how makeup can help you in achieving different moods which express what you feel, it express season, it express happiness and sorrow. It feels so great being a tiny part of makeup world. 12- What top 5 make-up tips can you give to sisters reading this? A- * Make your own style. * Always be aware of your best features and work on it . * Before buying makeup do a research, and buy makeup according to your skin type, texture and facial tone. Trust me it does make a huge difference, rather than blaming a product as useless. * Pick the product which can be used in several ways, be creative with that. * Last but not the least, take care of hygeine when it comes to your makeup. Keep them sanitized especially products used on daily basis, to get rid of that myth that makeup damage out the skin, obviously it would if you wont wash your makeup applicater, if you wont keep your makeup clean. 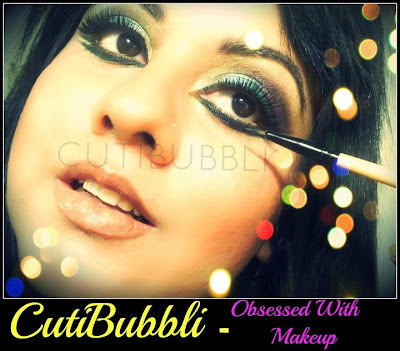 13- -What have been your biggest achievements with regards to CUTIBUBBLI OBSESSED WITH MAKEUP ? A- Well my acheivement is recognization, representing my country on a very small level, praise and prayers of my fans. Thats enough! 14- What does the support from your fans/family/loved ones mean to you? A- I would give credits to credits to my family, my parents, my sibling, especially my special Aqqi, who is a huge support through out my journey , friends, and my bestie Zunaira, whose support brought me where I am today. Though I am on the process where I want to be but whatever I have today its just due to their support and blessing of ALLAH. 15- Have you got anything new or exciting planned in the near future with regards to your make up styles? 16- What you want to say with your fans and makeup addicts? Thank you Sana for giving me an honour to share myself and my views. Happy Eid In Advance. I have a treat for you and your fans , my Eid makeup look! It was lovely having you Farah , You are a sweetheart . So what do you think about her ? 6 comments on "Guest Post [Fun Interview Of CutiBubbli of YouTube]"